Khansaheb Sykes deliver dewatering pumps in Abu Dhabi for Wellpoint Dewatering to allow infrastructure works to be excavated for a new city development. Khanshaheb Sykes scope of work at the project was only to deliver dewatering pumps, as the main contractor was using a trenching machine as the dewatering solution at the project. 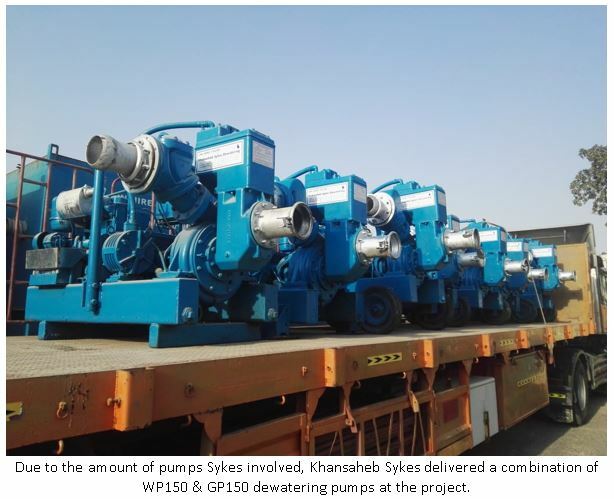 Khansaheb Sykes to date have supplied in excess of 100 dewatering pumps to the project. As the UAE’s leader in providing dewatering solutions, we pride ourselves in being able to suggest the most adequate, budget friendly and timely services in order to support your construction projects, whether it be Deep Well dewatering, wellpoint dewatering or purely dewatering pumps for hire activities. To know more about our dewatering pumps rental fleet or our expertise as a dewatering solutions provider in the UAE and GCC regions, contact one of our sales experts on 800 79537 or email us on [email protected] to know more! This article was posted in Booster Pumps, Deep well dewatering, Dewatering Pump, Pumps, Wellpoint dewatering and tagged deepwell dewatering, Dewatering, dewatering pumps, dewatering solution, Ground Water Control Specialist, Wellpoint dewatering. Both comments and trackbacks are closed.